Obsolete: The Abu Beavis and Abu Butthead trial begins. Hot on the heels of the semi-collapse of the liquid bombs trial, one half of the Abu Beavis and Butthead team, the other half having sadly expired after setting himself on fire, along with a supporter and funder, are up before the beak charged with conspiracy to murder and and conspiracy to cause explosions. 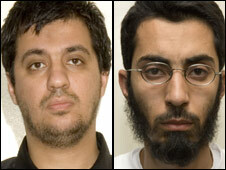 In a way, Bilal Abdulla and Mohammed Asha were actually far less successful even than their counterparts in the liquid explosives case; they, after all, had no chance of actually carrying out their plot due to their being under constant surveillance by the security services, even without the doubts about whether their plot was viable being brought in. The idea of planes exploding mid-flight over the Atlantic however, especially when both politicians and police had conspired to describe the non-existent threat from the gentlemen as a plot to mass-murder on an unimaginable scale, did far more to frighten and cause fear in the general public than Abdulla and Asha's actual failed attempts did. After all, the thought that someone could carry a bomb onto a plane that is no bigger than a soft drink bottle and which can destroy it utterly is terrifying: how do you mitigate against it happening? Abdulla and Asha however, through both their sheer incompetence and the politicians and police who unlike the previous year, reacted calmly and efficiently, with it quickly becoming apparent that the men didn't actually have any genuine explosives other than petrol and patio gas canisters, pretty much didn't scare anyone. This was almost comedy, and it should have been responded to in such a way. "[T]he repeated attempts to detonate the vehicles failed but that was not through any lack of effort by the bombers. It was no more than good fortune that nobody died." Well yes, their intention was undoubtedly to kill people. Intention and properly executing that intention are two entirely different things. In the worst case scenario, if the gas had been sparked by the phone, there would have been a fireball, which would have Italian Job style perhaps blown the doors off, and perhaps distributed some of the nails into the vicinity. If someone had been reasonably close to the cars, the flying debris could have seriously injured or killed them, if "good fortune" had been on the side of the men responsible and if the luck of those passing was truly out that night. Similarly puzzling is the description of the following day's "attack" on Glasgow airport as a suicide mission, as there is no indication apart from Kafeel Ahmed's dousing himself with petrol that this was to result in their deaths. The trial might perhaps clear up what did happen that day, as it still remains unclear: had they already set some of the petrol on fire before ramming into the airport's entrance, in the hope that it would heat the canisters up and cause them to explode, or had something else gone wrong with their apparent panicky attack? Either way, this further showed how canisters, even when close to fire, need to be heated to a very high temperature before they'll burst, something which they failed to do despite as the prosecution saying, the fire burning "fiercely". Also rather rhetorical and not backed up by facts was Laidlaw's statement that one of the most "extraordinary things" about the case was that Asha and Abdulla were doctors. Taking the Hippocratic oath is no barrier to becoming a terrorist: Ayman al-Zawahiri himself was a surgeon, something he is still referred to as. You don't have to bring up Harold Shipman to know that doctors can harm as well as heal; their employment hardly affects their politicial views. The "evil" doctor is as much a cliche as the crazy psychiatrist. It'll also be interesting to note if any allegations are made of al-Qaida connections. The media at the time speculated furiously that this inept attempt at bomb-making was their work, but there has been nothing whatsoever so far to substatiate it. Nothing also seems to have been brought up today regarding it, other than that the two men with Ahmed made up a "small" cell. Their lack of connections with al-Qaida can be taken as either good or bad news depending on your outlook. It can be seen as good in the sense that the group itself does not appear to have numerous sleeper cells waiting for the call to come for them to start their own plots or attacks, despite the claims that there are up to 2,000 terrorists supposedly just waiting to do us harm, and that gaining access to both the group and to its undoubted expertise in bomb-making is far more difficult than has been made out; while also bad in that if this small cell was apparently operating purely out of its interest, with no wider allegiances, that there are likely to be other such fanatical small sects, perhaps building each other up towards the ultimate aim of launching attacks, completely out of the sight of the security services and police as these 3 apparently were. The upside to that is that are obviously far less likely to be knowledgeable in making explosives or causing explosions, as even the scientific knowledge of these men apparently didn't help them. Either way, while we ought to remain concerned about the possibility of groups such as these growing in confidence and expertise, the biggest threat by far still remains those who have gone to fight in Afghanistan/Pakistan/Iraq or the slightly more exotic jihadi breeding grounds, such as Somalia or Algeria/Morocco, perhaps even Yemen returning and bringing their knowledge back from what their own leaders have described as "universities" of terror. The two bomb attempts outside Tiger Tiger were originally linked by the press to al-Qaida in Iraq's car bombs, for example, but if there's one thing the ISI knows how to make it's bombs that actually work to horrific effect, as their released videos showcasing "martyrdom operations" testify, and they involve explosives, not gas canisters, although a recent attack did involve the use of a fuel tanker as the VBIED. The use of suicide attacks where vehicles are packed with genuine explosives are probably the biggest nightmare of the authorities, outside of the tiny risk of the use of so-called "dirty bombs" or chemical or biological weapons. Explosives though are difficult to come by in this country, hence why our attackers have favoured the more easily available hydrogen peroxide. All this is further reason not to fearmonger or overstate the deadliness of Abu Beavis's and Abu Butthead's "device"; should a real one come along we might well regret claiming that it could have caused such mass murder when a real one undoubtedly would. ONe question that has caused me some difficulty with this case is a legal one. Why is the trial in England? Why for an act committed bytwo Scotish residents in a Scottsh location, does English criminal law appear to apply? And why were the prosecuton authorities in Scotland so keen to get shot of the case - without a word of complaint on this front from an SNP government? As a Scots lawyer I find this bizarre.